Our locally operated business is well known throughout the state. We’ll take care of what you care about the most, your home. No matter the condition of your home’s exterior, we’ll improve its appearance with our personal touch. You can be certain that we’ll provide you with high quality services that will not disappoint. Our prices are competitive and our power washing technicians are some of the best in the industry. Contact us today to schedule your free estimate today! 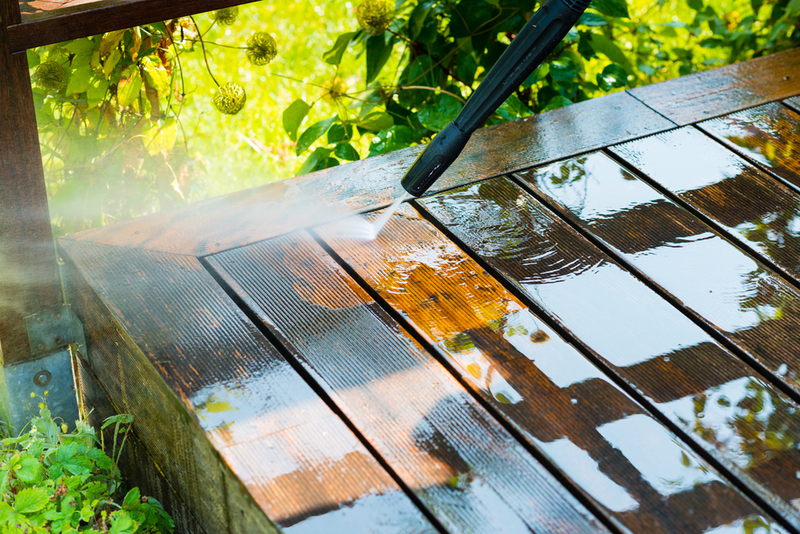 Our deck cleaners can revitalize your deck with a thorough cleaning. With the proper detergents and techniques we are able to remove stubborn stains and dirt that has penetrated into the surface. All our methods are safe and effective. If we see something that we know needs attention we will properly inform you and suggest the best ways to fix it. With our cleaning services you won’t have to pick up, clean or return any rental equipment- and best of all, the job will be handled by a professional who knows how to care for your deck and patio while making it shine. Contact the experts today! Our #1 recommendation to every client is that you schedule regular maintenance to keep your property looking its best. Whether that is roof cleaning, gutter cleaning services, window cleaning, or patio washing. In order to protect your investment it is vital that you maintain the condition of your home to keep it looking fresh and clean. Patio Cleaning for us, is easy, because we have the right tools and expertise. We will send a certified and professionally trained employee to arrive with all of the proper equipment needed to clean your exterior living space. In the end we guarantee your patio will be free of algae, mold, and dirt! Allow us to show you how clean we can make your patio. Your deck is an outdoor extension of your home. But being exposed to nature, it needs regular maintenance and repairs to keep it a safe, pleasant place for entertaining guests. Our regular washing services will keep your patio in great condition for the years to come. Be sure to learn more about our different power washing techniques, including soft wash.
We offer all of our services at affordable prices. It is our determination assist our clients better and give them the most effective results. Our dedicated staff invests the time and energy necessary to be well prepared for any unique requests or special concerns our clients may have. So what are you waiting for? Give us a call today. As homeowners ourselves we know keeping your homes appearance in order is a must. We understand that the quality of our work reflects on your property, which is why we strive to do things right at all times. We pledge to all of our customers that you can count on our knowledge, expertise, and experience in the industry. Our cleaning experts have powerful and effective solutions to get rid of the toughest stains. If you are not happy with our work we will do everything we can to fix that. We like making our customers happy. This includes being prompt, communicating with you to find out exactly what you would like us to do and making you aware of any potential issues that we may see. 100% Satisfaction Guaranteed! My husband and i are very impressed with this company overall. great communication and very smooth process start to finish. Thanks for cleaning our outside patio. High quality deck cleaning services. Columbia brothers power washing crew showed up on time and did a great job. Awesome pressure washing services! We got our deck cleaned by this company and they did a spectacular job! We are very impressed. Thanks for helping us remove the ugly stains that were on our deck. You guys do wonderful work, and we are excited to work you guys again. We received great pricing for getting our windows, gutters and patio deck cleaned! The results were incredible! Thanks for restoring the needed curb appeal to our home! We are so happy with the results that columbia brothers power washing helped us achieve. They washed are deck and siding! I highly recommend this company! 5 star services!!! Thanks for making our patio look like new again!! !